Injury piles on insult, when the rule of law jumps to conclusions in forcing facts to fit a legal theory. Take the rights of individual citizens in a representative democracy. Start with Freedom of Speech. Then force the facts to monetize it. Spending power moves up the ladder, on a slippery slope, from a benign property right to “Battle Star Gallactica”. Equality of Opportunity switches place, through the same hocus pocus, with noblesse oblige. 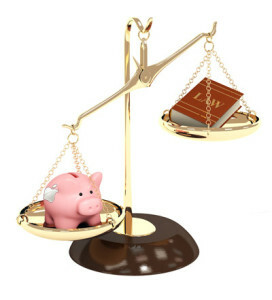 Put freedom of speech in the judicial blender, thus, and it comes out money talks. Since individual citizens freely associate in a representative democracy, through another leap of judicial faith, there’s an associative property in the exercise of a Constitutional right. The ‘right’ of individuals to speech in free association – which made plain sense before it was monetized – reproduces itself through Constitutional DNA to conjure an Origin of Species in free associations, including corporations. So “political speech does not lose First Amendment protection simply because its source is a corporation” (Citizens United v. Federal Election Commission, Supreme Court of the United States, 129 S. Ct. 2893 on June 29, 2009). Just don’t try it in Zuccotti Park without a permit. Perish the thought that “a democracy cannot function effectively when its constituent members believe laws are being bought and sold” (dissent of Justice Stevens in Citizens United v. Federal Election Commission), because “it never shows (Justice Scalia) why ‘the freedom of speech’ that was the right of Englishmen did not include the freedom to speak in association with other individuals, including association in the corporate form.” On condition of proving the negative to a Justice of the Preposterous, the Bill of Rights is coded in crowd sourcing. So money talks, and the more the merrier. In the rite of passage from singular to plural – as rights transfer through a constitutionally promiscuous associative property – monetization orbits the transnational mobility of anonymous capital. Shares of ownership command votes “in the corporate form”. It ain’t just Englishmen exercising “the freedom to speak in association” with the New York Stock Exchange (NYSE). Whether there’s any way to show “why ‘the freedom of speech’ that was the right of Englishmen did not include the freedom to speak in association with other individuals”, it didn’t restrain the English Football Association from stripping John Terry in February 2012 of their World Cup team’s captaincy on suspicion of exercising such ‘right’ in a racist remark that also came with a Crown Prosecution kicker (“John Terry Verdict: FA Finds Chelsea Captain Guilty Over Racism Charge” in The Guardian on September 27, 2012). Neither did it afford Her Majesty’s Fleet Street armada safe harbor from charges of bounty hunting for tabloid news (“Parliament Asks Murdoch to Discuss Hacking” by Christine Haughney in The New York Times on July 9, 2013). Be careful what you wish for – forcing facts to fit a legal theory – because you just might get proof of the negative. Constitutional rights shouldn’t be low lying fruit in a Clockwork Orange grove. While we’re weaving tales from the crypt of English cobwebs, how’s this for an “association in the corporate form”? Photo Source: The National Archives of the United Kingdom. “The East India Company foreshadowed the modern world in all sorts of striking ways. It was one of the first companies to offer limited liability to its shareholders. It laid the foundations of the British Empire. It spawned Company Man…The Company lasted for far longer than most private companies precisely because it had two patrons to choose from — prospering from trade in good times and turning to the government for help in bad ones.” (“The East India Company: The Company that Ruled the Waves” in The Economist on December 11, 2011). When partisan politics gets the gears of Justice stuck in reverse, big surprise if the legacy of British corporate prerogatives goes loony tunes overruling the Declaration of Independence. “A Corporate tax haven is a country or jurisdiction which sets the right conditions and encourages corporations to set up and use the said country as its residence…Corporate tax havens are mostly offshore jurisdictions.” (“Corporate Tax Havens” in TaxHavens.biz) “The majority of corporate tax havens have zero taxation schemes applied to offshore companies which are incorporated in the jurisdiction but have no business operations there. Offshore companies whose incomes (interest gained, dividends, and profits) are gained outside of the jurisdiction will pay no taxes at all.” Who besides the brain dead actually believes that this creates American jobs? 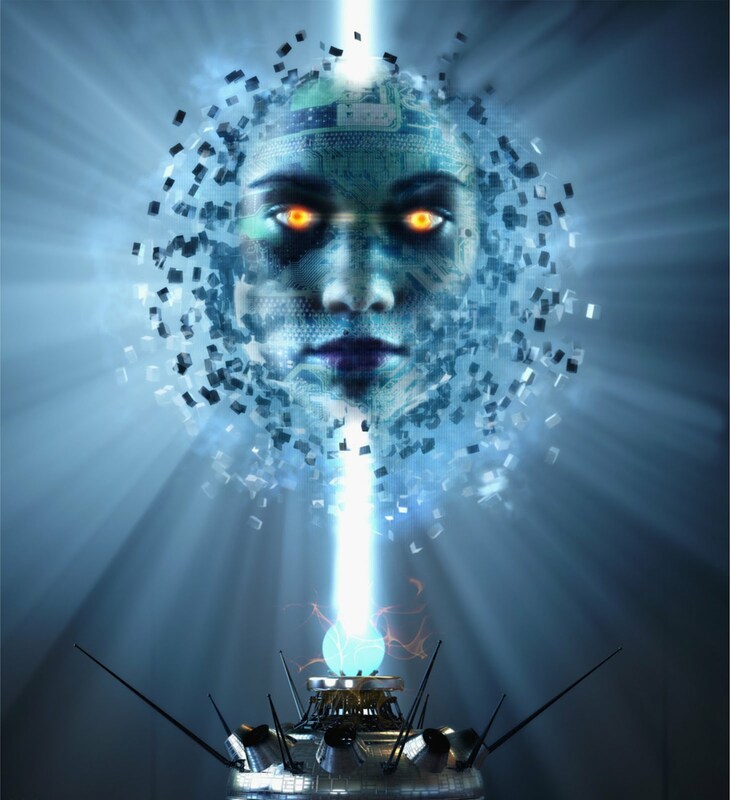 “Artificial Intelligence”: Less of the Machines | Channeled Essence. 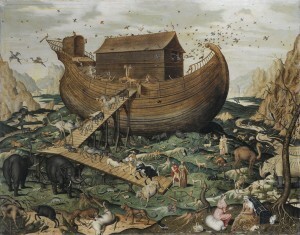 “Follow the Leader”: Noah’s Ark on Mount Ararat by Simon de Myle – Wikimedia Commons. It’s just not in the job descriptions of institutional investors to do much more than vote with their feet in the game of thrones. Even though they literally own the outcome, this is a herd with the DNA to follow rather than lead. Whether this is a rising tide that lifts all ships, they are only along for the ride. Speaking in tongues scrambles static filters for good reason. It’s the same reason why check balancers ought to balance their own checks. If rule of law – in the application of judicial precedents to moving targets (stare decisis) – wasn’t instrumental in Constitutional adaptability, why would we bring it back to a prime time Operating Room every year for reconstructive surgery? “The Supreme Court on Tuesday [June 24, 2013] effectively struck down the heart of the Voting Rights Act of 1965 by a 5-to-4 vote…Chief Justice Roberts wrote that Congress remained free to try to impose federal oversight on states where voting rights were at risk, but must do so based on contemporary data…Congress renewed the act in 2006 after holding extensive hearings on the persistence of racial discrimination at the polls…In her written dissent, Justice Ginsburg said that Congress was the right body to decide whether the law was still needed and where.” (“Supreme Court Invalidates Key Part of Voting Rights Act” by Adam Liptak in The New York Times on June 25, 2013) “The question in this case, she said, is, ‘Who decides?’ Congress or the court? The post-Civil War amendments, she observed, are not like many other provisions of the Constitution that treat Congress with suspicion. The First Amendment, she noted, says ‘Congress shall make no law…’ In contrast, the 15th Amendment ‘instructs that the right to vote shall not be denied or abridged on account of race, and it vests in Congress the power to enforce that right by appropriate legislation’.” (“Supreme Court: Congress Has To Fix Broken Voting Rights Act” by Nina Totenberg in All Things Considered broadcast by NPR on June 25, 2013) Just what we needed in this country: Jim Crow trading in his white sheet for a black robe. Who knew voting rights count for less than the corporate right to buy votes? La Balsa de la Medusa (Museo del Louvre, 1818-19) by Jean Louis Théodore Géricault: http://en.wikipedia.org. So far from a parliamentary “association” of Englishmen, “the corporate form” is a vessel for such DNA as the People’s Republic of China and the royal House of Saud. With the ink still wet on the U.S. Constitution, its authors would’ve thought it creepy for life tenure on the bench to become a celebrity cult around annual séances on “Secrets of the Dead”. The message in their experimental media was checks and balances. In order to balance a rogue judiciary that meddles in its own peddle, Congress need only check whether a Justice of the Preposterous has gone bait and switch since his job interview. Perjury is an impeachable offense under the U.S. Constitution. “A Mosaic Law by Frederick Dielman”: http://www.wikipedia.org. 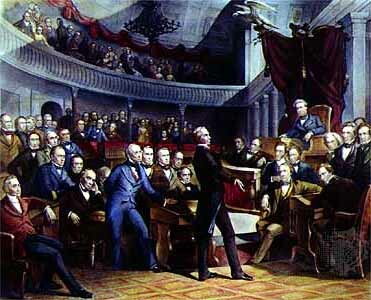 “The germ of dissolution of our federal government is in the constitution of the federal judiciary; an irresponsible body, (for impeachment is scarcely a scare-crow) working like gravity by night and by day, gaining a little today and a little tomorrow, and advancing its noiseless step like a thief, over the field of jurisdiction, until all shall be usurped from the States, and the government of all be consolidated into one.” (Thomas Jefferson, Letter to Charles Hammond, 1821) Wearing a blindfold to work, Justice doesn’t even come close to what vanity can’t find in the dark. Sovereign Wealth Fund Rankings on http://www.ameinfo.com. “The Utility of the Union in Respect to Commercial Relations and a Navy” by Alexander Hamilton in Federalist No. 11 published November 24, 1787. “John Terry Verdict: FA Finds Chelsea Captain Guilty Over Racism Charge” in The Guardian on September 27, 2012. “Parliament Asks Murdoch to Discuss Hacking” by Christine Haughney in The New York Times on July 9, 2013. “The British East India Company — the Company that Owned a Nation (or Two)” by George P. Landow, Professor of English and the History of Art, Brown University on The Victorian Web. “The East India Company: The Company that Ruled the Waves” in The Economist on December 11, 2011. “Boston Tea Party” by Thom Hartmann in Unequal Protection: How Corporations Became People and How You Can Fight Back, ©2010, published by Berrett-Koehler Publishers, Inc.
“U.S. Companies Lobbying Furiously To Save Corporate Tax Loopholes” by Mark Gongloff in The Huffington Post on June 18, 2013. “Corporate Tax Havens” in TaxHavens.biz. “Tax Havens: The Missing $20 Trillion” in The Economist on February 16, 2013. “Institutional Investors and Stock Market Liquidity: Trends and Relationships” by Marshall E. Blume and Donald B. Keim under auspices of The Wharton School at the University of Pennsylvania in a draft dated August 21, 2012. “The Supreme Court’s Cult of Celebrity” by Craig Lerner and Nelson Lund in The Volokh Conspiracy on January 19, 2010. “Supreme Court Invalidates Key Part of Voting Rights Act” by Adam Liptak in The New York Times on June 25, 2013. “Supreme Court: Congress Has To Fix Broken Voting Rights Act” by Nina Totenberg in All Things Considered broadcast by NPR on June 25, 2013. World Bank’s 2011 GDP Ranking. “Meaning of High Crimes and Misdemeanors” by Jon Roland of The Constitution Society. “Thoughts on Government” in April of 1776 by John Adams in The Founders’ Constitution, Vol. 1, Ch. 4 published by University of Chicago Press. Thomas Jefferson, Letter to Charles Hammond, 1821. 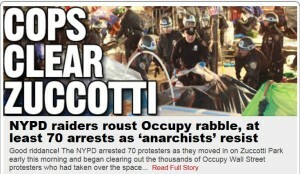 “Cops Clear Zuccotti Park”: http://legalinsurrection.com. “No Speech Without Permit”: http://spiritual-journal.blogspot.com. “The British East India Company”: The National Archives of the United Kingdom.